Keep your snacks at the perfect temperature with your very own personalized cooler bag. This stylish and functional zip up bag is fully insulated to ensure your treats always taste their best. The clean white interior is water resistant, so you don't need to worry about any spills or leakages. Your bag also comes with an inner strap to keep your food and drink in place. 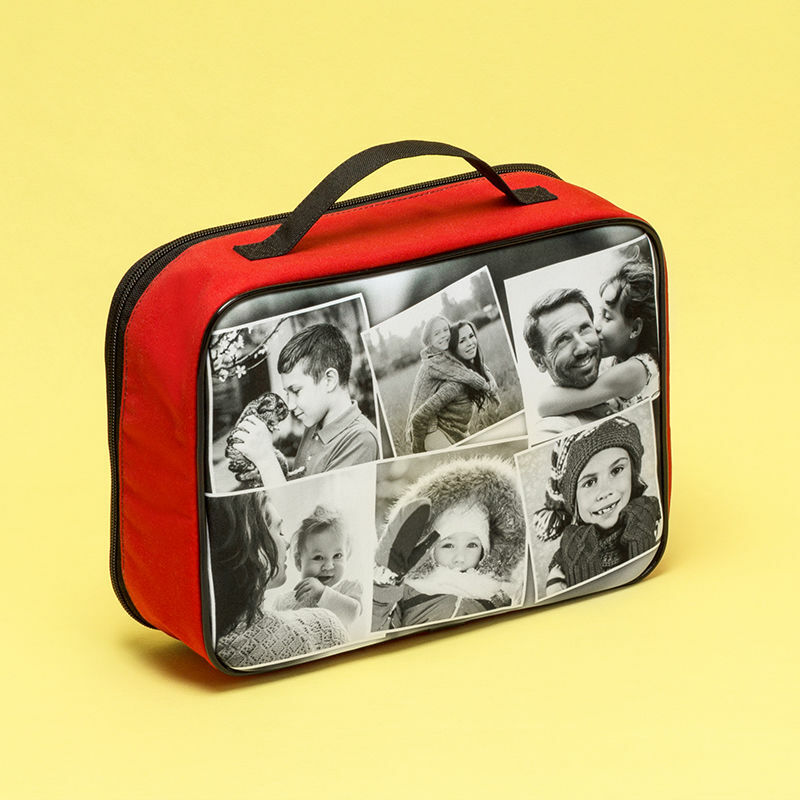 Choose from 6 different canvas colors to complete the exterior and print your photos onto the front and back of the bag in stunning HD quality. The sturdy handle is the perfect finishing touch, and will allow you to carry your customized cooler bag around easily. Dimensions: 11.22" x 8.46" x 3.35"
Give your lunch and snacks the treatment they deserve by carrying them in your very own personalized cooler bag. This handy bag is as stylish as it is functional. With a tough and durable canvas exterior, your photos and designs are printed in full color HD onto our gorgeous Monroe Satin. You can print photos onto the front and back, and enjoy your treats in a more personal way. The interior is fully lined with an insulated material, that will keep your food at its ideal temperature. It is also water resistant, so if your soup, tea or juice leaks, it is very easy to clean it up without having to worry about ruining your customized cooler bag. You can choose from 6 different canvas colors; black, blue, green, pink, red, and yellow to complete the look of your bag. Inside, there is also a strong strap, which will keep your snacks from moving about too much. Completed with a sturdy metal zip and strong canvas handle, this cooler bag is a must have for work, school, travelling, and play. 11.22" x 8.46" x 3.35"
Super easy to customize and really good quality for the printing and the bag itself. Hello, I loved the product, the quality of the pictures were Great! Lunch box turned out perfect. Fixing my poor work for me was top notch stuff. Thanks!!! Who Would Love A Personalized Cooler Bag? Anyone who eats their breakfast, lunch, or dinner on the go would truly appreciate one of our stylish cooler bags. They make great snack bags for when you go out with the kids, and if you have warm or cool baby food, then you can be assured that it will remain at the ideal temperature for baby to enjoy. They will also keep drinks nicely chilled, so if you find yourself on an outing on a hot day, load your cooler bag up with water bottles and juice boxes and the whole family can enjoy a cool drink while enjoying the sun. The personalized feature adds a fun touch to the bag, and don't forget to add names to take the customization to the next level. Buy more than one cooler bag and receive a great wholesale discount. Select the quantity as needed, save the basket and contact the customer service team for more detailed information. Your cooler is handmade by a team of skilled seamstresses and print technicians, with no minimum order amount. Your images are printed onto the front and back of the cooler bag onto our beautiful and luxurious Monroe Satin. This fabric has a slightly textured face, so your photos will look vibrant and bold, and will have a slightly soft finish. Every bag is handmade to order, with each piece hand cut and stitched together. The satin edges are neatly closed to prevent fraying and to ensure your images look their best. Smart piping is added to outline the prints and give the bag a neat edge. Once the printed sections are finished, the rest of the bag is constructed. The canvas is added and the insulated lining, along with the double zip and handle. The overall effect is smart, stylish, and sleek. The perfect way to enjoy your sandwich and your photos. There is a good amount of space for you to fill, and you have both the front and the back to add your photos to. Single photos look striking and bold, and photo montages also look very impressive. You can place a photo on one side and on the other add your name in a funky font. This would make it very easy to identify if the bag was placed with others. Why not treat your children to their own personalized cooler? They make excellent bags for packed lunches, and they would love to have one that was made especially for them.